Product Sample: Complimentary products of my own choosing were provided in exchange for this review. All opinions are my own. :) Affiliate Links: If you click on a product below, I may make a very small commission. I’ve been a Whole Foods shopper for as long as there’s been one in my area. Meaning… basically after I graduated college. One of the first things I did when I started shopping there was scope out the health & beauty aisles. I’ll admit that it’s been awhile since I truly took a look at their product offerings. Typically I pop in for my Dr. Bronner’s, sunscreen, and some bar soap for Dave, and then I’m onto the groceries. That was, until, I found out about the Whole Body & Cosmetics sale that happened last weekend. Whole Foods in Bellevue invited me in for a little sneak peek and tour of their cosmetics and body offerings… and my list was scary long. I went in on Saturday morning prepared to conquer, and then had to stop myself from buying everything. Rough life, I’m telling ya. So, what did I end up with you ask? I thought I’d share with you what I’ve picked up, and my first impressions (considering I just got everything on Saturday) of the products thus far. 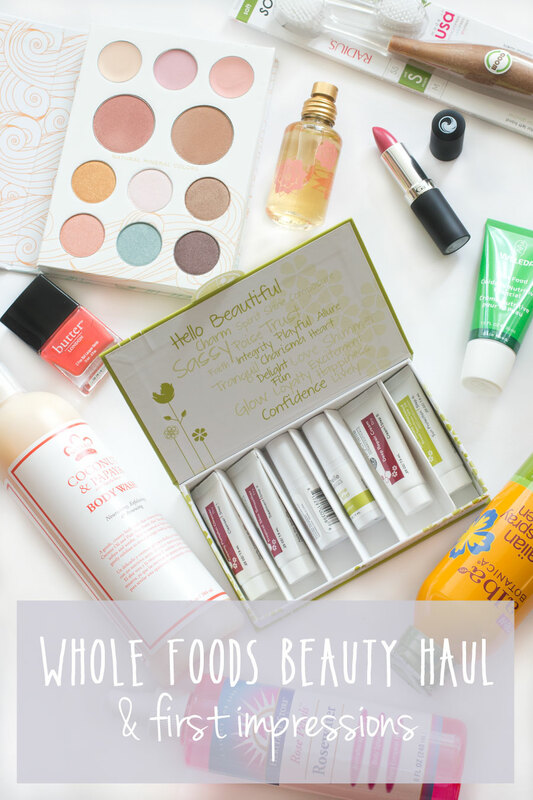 Have you ever shopped at Whole Foods for body or beauty products? What are your favorite natural products? I’d love to try out the sunscreen….I have a hard time finding one for my sensitive skin! I do too, and I’ve had great luck with Alba Botanica! Thanks for entering, Amanda! Looks like you got a lot of great products! That lip color looks great on you! I’ve been getting the Petit Vour beauty box – natural, vegan and anti animal cruelty beauty products. I can’t pick one fave though! I love to buy produce and cheese at Whole Foods. Plus their bakery is the best! Their bakery is amazing, thanks for entering Meegan! I’ve heard great things about Zuzu Luxe! Thanks for entering, Stacey! i’ve been meaning to try butter nail polishes! I had too, so I was happy to grab one. They’re great! We always get the natural peanut butter at Whole Foods. Their natural peanut butter is great. Thanks for entering, Steve! I’ve never bought beauty products there but sometimes i test a little bit of hand cream there because i love it. Well i do buy the shower gel there, i think that counts! That definitely counts. Thanks for entering, Abril! i’ve never bought anything at whole foods, but i wasted some time in there waiting for someone. i was really shocked by all the non food items. thanks! That lip color looks great on you! I would love to try the Butter London nail polish. I’ve heard good things about it! 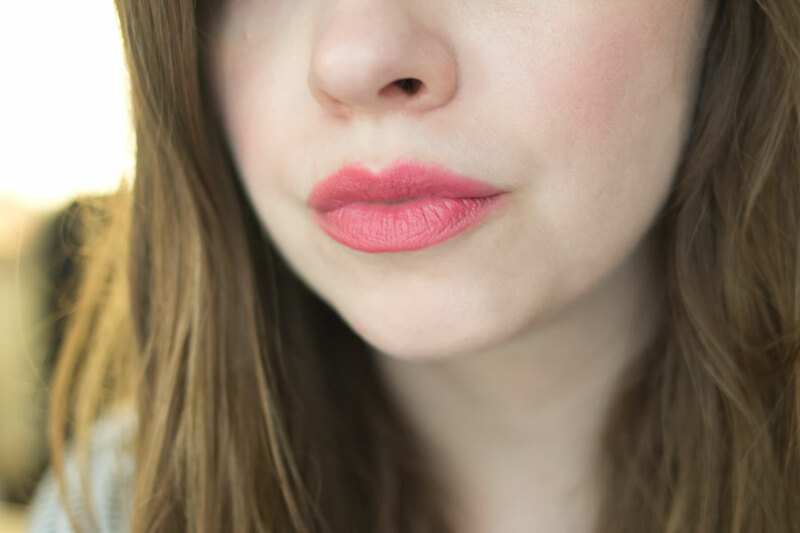 I love that lip color, it looks great on you! And who doesn’t love Whole Foods?! I’ve been more curious lately about Whole Body. Unfortunately, the sales clerk is cranky sourpuss and makes it hard to see if you want to buy something. I would soo adore to spend more time adventuring through the beauty products. I just tried aura casia rosehip oil, nice! and I would like to try a different brand they have of organic rosehip oil that is more expensive but it doesn’t have vitamin e added. I have tried South of France soap when it is on sale and it is soo nice! woops I see this is only for seattle – I’m from another state. sorry. Oh no, that’s too bad! Hopefully she isn’t always there so you can better scope out their products. I’ve been meaning to try rosehip oil, I’ll have to grab some next time I’m there. Thanks for entering, Rosie! I love to pop into WH for a bottle of kombucha and maybe one of their ready-to-go salads!! Sounds like good choices! Thanks for entering, Cynthia! I love to buy teas, essential oils, bar soaps and hand soaps at Whole Foods. Oh great picks – they have a huge selection of oils and soaps! Thanks for entering! Besides food, I love the goat bar soaps, i wear just EWG recommended sunscreen that I find there but I haven’t buy much make up yet. I know right? Trader Joe’s is my other favorite too. :) The goat bar soaps are awesome, and so inexpensive! Good luck, Marifer! Whole Foods has a really taste Superfood salad with kale and sesame. It’s in the deli. That’s my favorite thing to get… Is that sad? Haha, not at all! That sounds really tasty! Thanks for entering, Sarah! I really love buying natural lip balms and bar soaps as little gift items for friends–stocking stuffers, or something that can be tied on top of a birthday package. They always smell so good!!! That’s a great idea! Thanks for entering, Martha! Love Whole Foods, and their great selection of natural beauty products. Their hot food bar though…yum! I love their hot food bar too! So good. Thanks for entering, Lo! My favorite things to get at whole foods are nuts, fresh produce and their muffins. Thanks so much for entering, Natalie! I’ve never lived close enough to a whole foods before but now that we’re in Chico, I think we aren’t far from one! Hopefully I can actually get to one soon! I haven’t done much shopping at whole foods but it all looks delicious! And, I don’t use beauty products, not in the budget. Whole Foods definitely has some delicious stuff. Thanks for entering, Melanie! I love buying fresh salads from Whole Foods along with produce. Large variety and tastes delicious. They have awesome salads, and we love their produce too! Thanks for entering, Alina! Since winter is so long here in Michigan, I love buying their natural lip balm and also love getting fruits there. They have an awesome lip balm selection, and their fruit is awesome! Thanks for entering, Sean! I love badger face oil! I’ve heard great things, I need to try that! Thanks for entering! I like to visit the salad bar, the balsamic vinaigrette is so yummy!!! I definitely need to give the WH beauty department a try now! Yes, definitely do! They have some great options! We don’t have a Whole Foods locally, but whenever I’m travelling, I always like to visit them :) Next time I’m there, I really need to check out the Alba sunscreen! Thanks for the recommendation! I love the soap at Whole Foods and I’m excited to try all these other products. I have two favorites, one is my Avalon COQ10 Repair cleansing Milk & then my Derma e Very clear acne scrub. Both products work wonders for my skin. Both sound great, I’ll have to check them out! Thanks for entering, Nicole! I love that Lipstick!! Looks great on you!! Thanks for the giveaway! Beautiful photos! I love hitting up Whole Foods’ bulk foods aisle. I like to buy fresh fish at Whole Foods. I’m loving the rosewater I picked up – will have to try neem oil too! Thanks for entering, Star! I love to make my own peanut butter at whole foods. I love glycerin soap! Does that count as a natural beauty product? I love how it looks and how it rinses off easier than regular soap while being gentle on my skin. Sometimes glycerin soap can be hard to find, but Whole Foods always has some! Definitely! Whole Foods does have a great selection of soaps! Thanks for entering, Tracy! I like buying produce and cheese from Whole Foods. I also love Avalon Organics and Badger products! You got some of the best stuff! I love that section of Whole Foods! Thanks Chelsea! They really do have an amazing selection! hi, i don’t have a ‘whole foods’ really close, but i have been there once…and loved it. winning this gift card would take me back there to enjoy all the great things they offer. Thanks so much for entering, Margaret! I love to buy cheeses there – they have such an assortment. Thanks so much for entering, Ellen! I am always buying sunscreen there! They do have a great selection of sunscreen! Thanks so much for entering, Elizabeth! I like the hot bar at Whole Foods. Thanks so much for entering, Susan! I haven’t tried either, but will have to pick those up when I’m out of sunscreen. Good luck, Jenna! I actually have not been to Whole Foods before! We have one that was built by us not that long ago, but I have not ventured over yet. I really want to go and check out their gluten free products. I have heard they have a really good selection! They do have a great selection – you’ll have to go check them out! Thanks for entering, Laura! I love to have lunch at Whole Foods :] I’ve also been really wanting to try the Zuzu Luxe liquid eyeliner! I’ve heard great things about that liner! Thanks for entering, Stacey! I haven’t tried their lipsticks, thanks for the recommendation Becca! I’ve never shopped there for beauty products but I can walk around Whole Foods for hours. There is just so much to see. Haha, so true! Good luck, Nikki! I like buying from the bulk section at WF. By FAR my favorite natural product is the Alba Sunless Tanner! (http://www.albabotanica.com/sun/self-tanning/sunless-tanner.html) It gives me beautiful and soft, brown skin without the harsh chemicals or strong smell. Oooh that sounds great, thanks for the recommendation, I’m going to have to grab that this summer! I love Acure Organics products. Thanks so much for entering, Holly! I’ll have to try something from Acure Organics next! I really love natural foundations! Thanks so much for entering, Beth! I love Burt’s Bee products, especially the lip balm! Love Burt’s Bees too! Thanks so much for entering, Meagan! Thanks so much for entering, Amanda! I like to purchase tea tree oil shampoo for my teen. She loves it! Oh that sounds like a great item, I’ll have to look out for that! Thanks so much for entering, Barrie! My favorite natural beauty product is coconut oil because it is so versatile. I love to buy seafood and meat at Whole Foods. Thanks so much for entering, Patricia! I would buy a lot of fruits and vegtables if I won. Thanks so much for entering, Bridgett! I love nail polish by SpaRitual. Their INSTINCTUAL BODY OIL is also one of my fave natural products. I haven’t tried that brand yet, but will have to check it out! Thanks for entering, Angela! I like to buy organic fruit from Whole Foods. Thanks so much for entering, Connie! I like buying fruit and veggies and whole foods. Thanks so much for entering, Thomas! I like to buy my produce and deli meat at Whole Foods because of the selection and the freshness.